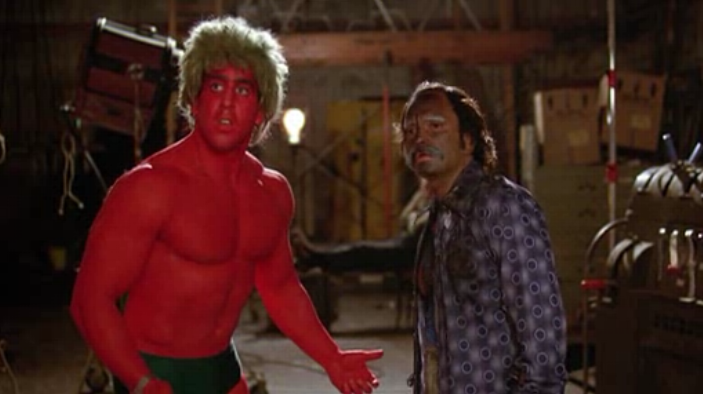 Cheech is visiting a movie studio where they’re filming a movie or TV show called Wamba when this guy covered in red looking like the Hulk (who was on TV from 1978 through 1982) asks Cheech which wall he’s supposed to break through. Cheech tells him a wall and the red dude bursts through. Considering Cheech and Chong wrote the movie, methinks they should get, at the very least, partial credit for creating the character that Jeph Loeb would introduce in-continuity in 2008. The resemblance is uncanny. There was a red Hulk on the old TV series with Lou Ferrigno as well. I just saw this old post. Very interesting. I think that you will find that Ken Johnson (Six Million Dollar Man, Bionic Woman, V, Alien Nation and oh yes, Hulk tv series) created the Red Hulk in the early to mid 70’s. What do I mean? 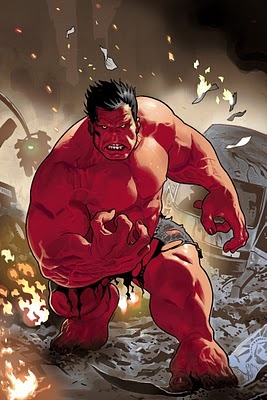 Well, when he started to make the Hulk tv series he wanted to make the Hulk red, as red is the colour of rage. Stan Lee said no. The whole thing is covered in the audio commentary in the Hulk pilot episode DVD. It is also mentioned in one of the Hulk 2003 movie tie-in books. So you see things would have been quite different in the Hulk universe if Ken Johnson had his way back in the magical 70’s! By the way, Joey Q suggested to Jeph Loeb about the creation of the Red Hulk. Joe was also involved with some the Hulk 2003 movie tie-ins. You can easily imagine him finding Ken Johnson’s old suggestion, filing it away and using it at a later date. At the end of the day, it’s not like Ken was going to use it. Also Joey Q used it in the creation of another, albeit ‘evil’ Hulk. It has worked out beautifully all round. Huh, very cool. Thanks for the knowledge bomb! You are most welcome. More links and info can be found on The Incredible Hulk tv series wiki page. Enjoy!